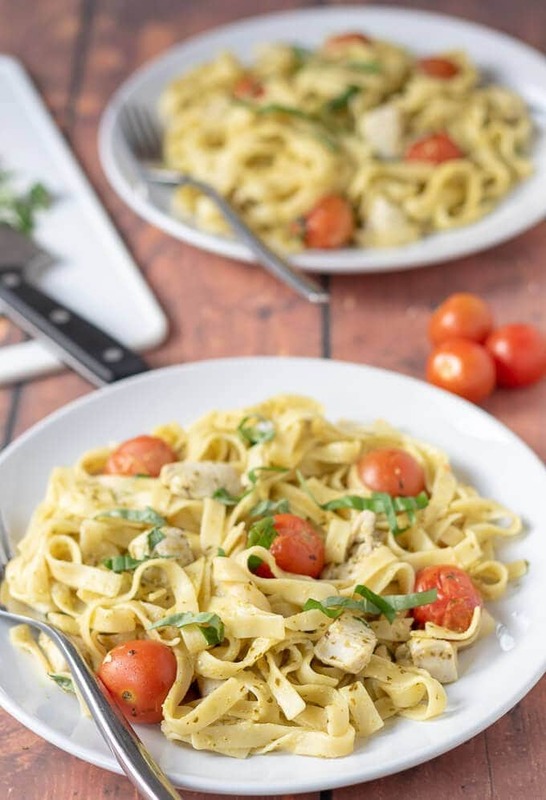 Pesto chicken tagliatelle is a fantastic 20-minute budget recipe just bursting with flavour. This easy pasta dinner makes for a comforting and filling weeknight family meal! You know folks when I think of comfort food what always comes first to mind is pasta. I mean don’t you agree that pasta is just the ultimate comfort food? It’s filling, easy to make, and is always perfect for dinner. 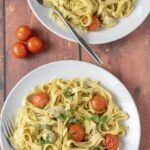 It’s tagliatelle pasta that’s particularly suitable for this delicious pesto chicken tagliatelle recipe! This creamy chicken pesto pasta is particularly suitable as a quick healthy weeknight dinner. It doesn’t take a lot of time and nor is it drowning in lots of cream sauce either. So that’s why it’s healthier! I mean don’t get me wrong, I absolutely love creamy pasta dishes made with full cream but I prefer to save those for when I’m out enjoying dinner at a real Italian restaurant. At home I don’t tend to cook with cream (except for when it’s in my desserts 😉 ). But that doesn’t mean that I don’t want my home cooked pasta dishes to be just as flavoursome and delicious as eating out. So I use crème fraîche as a substitute. 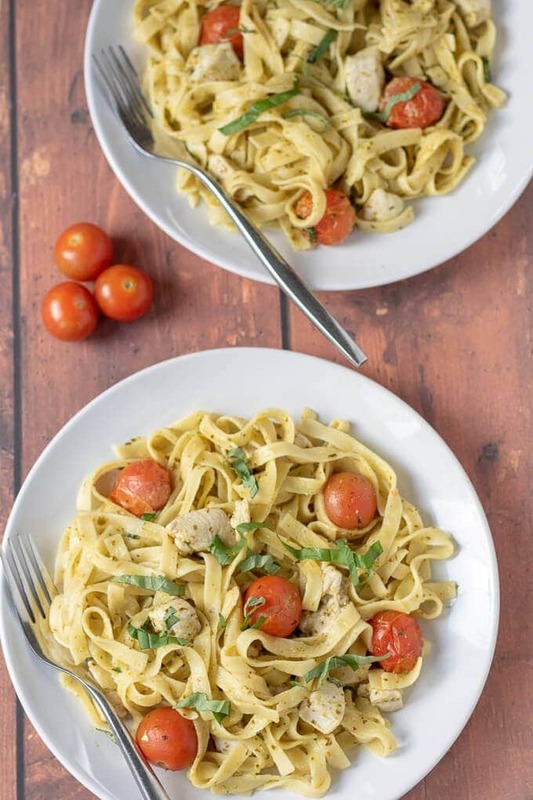 It adds a healthier base to this chicken tagliatelle’s sauce and when mixed with the pesto it still gives a delicious creamy texture and taste to this dish so you’re definitely not loosing out. This is one tasty recipe that I know you’ll want to book mark for those nights you don’t have enough time or just can’t be bothered! Get the tagliatelle simmering away on the stove. Sauté the chicken then add the tomatoes to soften them and add a delicious sweetness. Stir in the pesto and crème fraîche to make the dish nice and creamy. Mix in the cooked tagliatelle coating it well in the creamy sauce. Divide between plates and garnish with parmesan and freshly copped basil. Bellissimo! Tagliatelle with home-made pesto recipe is a step by step guide for how to make your own tagliatelle and your own home-made pesto. Impress your friends and dinner guests with your culinary skills with this simple, rustic Italian dish. 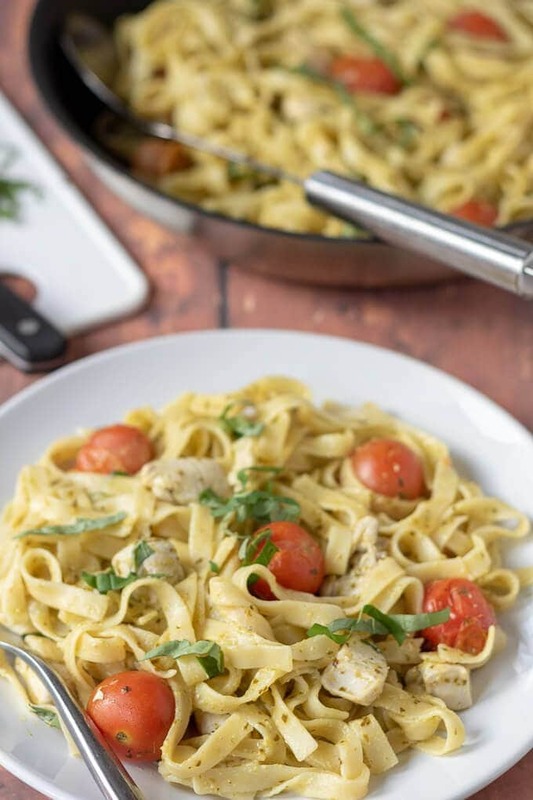 Crème fraîche tagliatelle chicken dinner recipe is a delicious fusion of chicken and vegetables cooked in low fat crème fraiche. Low fat tagliatelle carbonara is a lighter version of the traditional classic Italian pasta dish. Ready in just 30 minutes, this healthier recipe is the perfect weeknight low fat dinner. Well its taken me a bit of time to get this next one to you, seeing as I first mentioned it in the vegan mixed bean curry recipe last year! You see it was another one of the delicious vegan curries than Lynne and I experienced whilst on holiday in Zanzibar last September! Yes the curry coming next week is a re-creation of the aubergine and sweet potato curry. It’s really really tasty! Although I used tagliatelle pasta for this pesto chicken tagliatelle recipe you could easily use penne pasta instead or any pasta you have on hand. 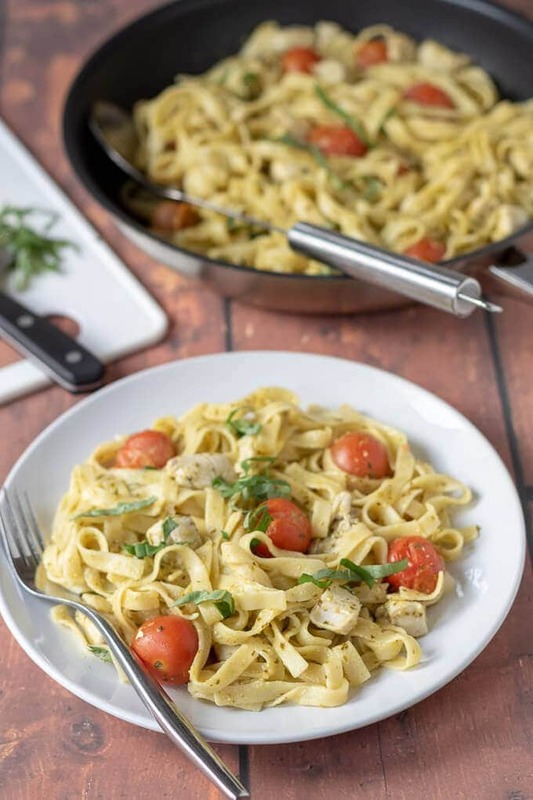 Pesto chicken tagliatelle is a fantastic 20-minute budget recipe bursting with flavour. This easy dinner is a perfect and comforting filling weeknight family dinner! Whilst the tagliatelle is cooking, gently heat the oil in a large pan / skillet then add the chicken and stir fry for 6 - 7 minutes until cooked through. Add the tomatoes to the pan and stir them in with the chicken until they begin to soften. Take the pan off the heat and stir in the pesto and creme fraiche. Return the pan to the heat and simmer for another 1-2 minutes. Season to taste. Once tagliatelle is cooked, drain it well and add it to the pan with the chicken. Mix well so the sauce coats the pasta. Serve topped with parmesan and fresh basil. *If you have time you could follow the instructions in the tagliatelle with home-made pesto recipe to make your own pesto! Using crème fraîche in this recipe is a great idea, Neil! I love an easy pasta recipe, and I almost always keep the ingredients around as ‘pantry staples.’ I’m totally filing this idea away for when we need a quick and easy (but delicious!) meal! A nice light creamy pasta you’ve got there Neil. We try never to be without Crème Fraiche, but then we’re pretty addicted to the stuff over here. We have three different butterfat content versions. the full fat is 45% and sooooo creamy (I love it). then there is 34% and 13%. The 45% comes from a local dairy and the other lower two are the standard market variety. What is the butterfat content of your reduced fat Crème Fraiche? Love this. Everything about this pasta is fabulous. I love creme fraiche as well, but I use nothing with reduced fat. I just personally have a problem with it. I love to mix cream with pesto pasta sometimes, but even evaporated milk works beautifully. I don’t know what the equivalent would be where you live. I really love it because it smells just like the unpasteurized milk I always got when I lived in France as a kid! I think it’s a personal preference as to what you use in your cooking although I use the lower fat versions of most things as I often don’t notice the difference in their taste anyway. And for health reasons too. Neil, I’m actually not a huge fan of creamy pasta dishes so I absolutely LOVE that this isn’t drowning in cream! I need to get my hands on some creme fraiche and try this out soon as my daughter absolutely loves pasta! Looking forward to seeing that potato aubergine curry next week – hoping you and lady lynne have a wonderful weekend! Thank you Shashi! So glad you like my new pasta dish. Once you get your hands on some Crème Fraiche I know you’ll find it useful in all your own recipes too. Hope you and your daughter have a great weekend as well! Bellissimo! Is right, Neil! This looks like a winner, and has my kitchen all over it! I love the idea of making a creamy pesto, and can’t wait to give this a try. I’ve never thought of using creme fraiche, what a great idea! Quick and easy and super flavorful – thanks so much! Crème fraiche is such a great alternative to cream Laura, I know you’ll love using it in your kitchen too. Thanks so much for your kind comments. Hope you are well! Don’t even remind me of the amazing food we ate in Africa! WAHHH! lol! If it was possible for her, my daughter would have pasta,daily! I am definitely going to treat her to your recipe. thank you so much for sharing. Have a great week.ahead.. This pasta recipe looks very tasty and easy to make. Pretty sure that my family would love this simple yet full of flavor pasta recipe. Thank you for sharing this one.